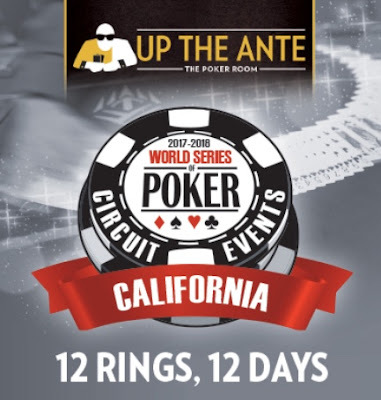 The $1,675 @WSOP Circuit Main Event kicks off tomorrow at Noon for the first of two starting flights in this HalfMillyGuarantee. Players begin with 20,000 chips and play 40-minute levels on the first day of play. Registration and a single re-entry per player, per flight, is available until the start of Level 13 at about 10pm. Play concludes at the end of Level 15 at about Midnight. There's a 75-minute dinner break scheduled at 6:30pm at the end of Level 9. Day 1B - the final starting flight - begins Saturday at Noon and follows the very same time schedule. Survive the 15 Day 1 levels and return Sunday at Noon to play 60-minute levels for the remainder of the tournament. Sunday's schedule is to play down to the final table, the 9 remaining players returning Monday at Noon to grind down to a champion. There's three $250 satellites on Friday and one on Saturday for players to win their way in to the Main Event. Tonight's $250 satellite is already at 146 entries, awarding at least 17 Main Event seats, and still has almost an hour left in registration.